You’re not still playing nDoom in black and white, are you? What decade do live in? 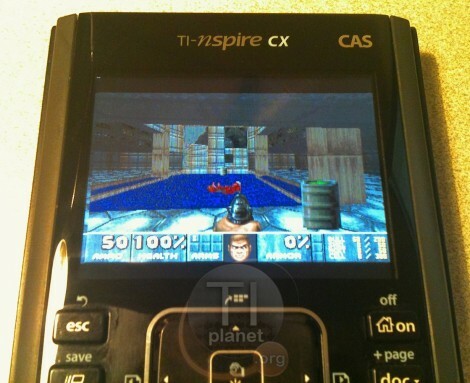 Thankfully, the Doom port for TI-nspire calculators has been upgraded to support color. That is if you’ve got the hardware to run it. The video after the break (and the image above) shows a TI-nspire CX running the popular first-person-shooter. It’s seen several upgrades since the beta version which we saw piggy-backed with a different TI-83 hack a year ago. The control scheme has been tweaked, and a menu system was added. It’s not the same on-screen menu that you would see with the DOS version of the game, but it accomplishes that same thing. This port is packaged with the Ndless program that unlocks the hardware so that you can perform your own hacks. Unfortunately there is still no sound available for the game but that is a project for a different time. We know it must be possible because we’ve seen a TI-84+ used to play music stored on a thumb drive. Man, I have 8mb on my 386sx, but it still won’t play doom. I mean, it will, but at it’s lowest screen size (and even then it’s slowish). It’s an SX16 overclocked to 25mhz. I love Doom. It has been ported to just about everything with screen attached to it. All hail the mighty 486 ! What decade do live in? English m*****f***** do you speak it? Playing this on a Sansa Fuze via RockBox is pretty awesome too. Why the hell does a calculator need a touchpad??? I always love to see Doom ported to a new device. It looks so smooth! Of course, it should be on such an overpowered calc! I tried this yesterday and it’s pretty awesome. Ndless freezes on the first install attempt on both my CX and Clickpad, but the second try works perfectly and I had no trouble running the Game Boy Color and NES emus, same for Doom.